On our last day of spring break we took the kids to Universal Studios Japan (USJ), which is located near the waterfront here in Osaka. I am not a fan of the big, themed amusement parks. 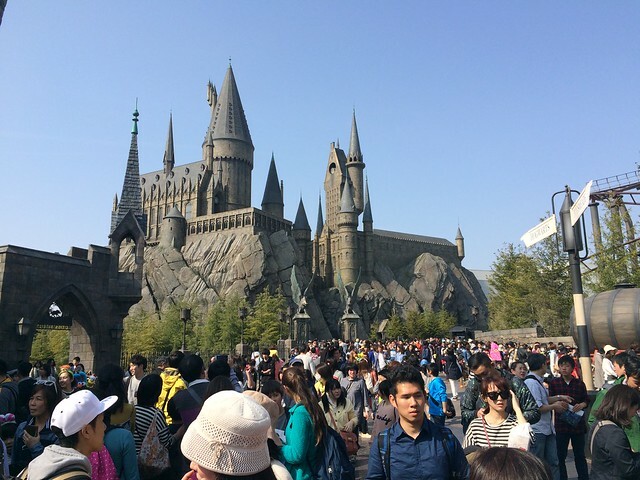 I find them artificial, expensive and crowded and USJ lived up to my expectations. I would rather spend my family’s free time out in nature or doing something spiritually uplifting or engaging with the mind rather than lining up for “attractions”. However, I was convinced by my lovely wife to give our children the experience, and she is right. It is one of the activities everyone should do at least once. We did chose a bad day to go as it is during the local schools spring break as well. In speaking with a friendly parking attendant on the way out to our car, he gave us the figure of 51,000 visitors that day. He said the day before the park welcomed 60,000. On a bad day, they usually get round 30,000. The demographics were overwhelmingly Asian, with mostly Japanese, but with significant populations from the Philippines, China and other Asian countries. I felt overwhelmed at the number of people as you can see in the photos in this post. All of the rides were between 90 minutes to 2 hours waiting time. There were even longish lines for getting food. My worst nightmare! 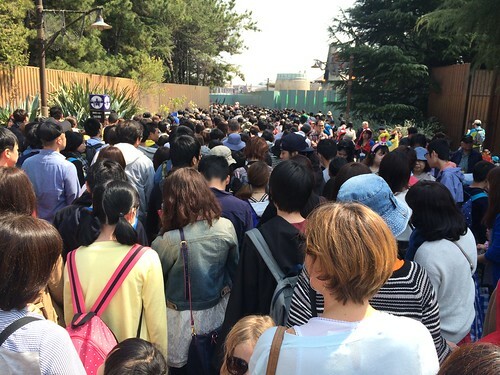 USJ was built in 2001 and the park has been highly successful throughout its history. It is the only non-Disney theme park to crack the top ten world wide in revenue and number of visitors. They are another one of those money-making machines, with for example, 9 dollar plastic souvenir mugs of “butter beer” for sale in the Harry Potter exact replica of Hogsmeade. Note that I am not a Harry Potter fan and I couldn’t get through the first book in the series. I don’t understand the universal appeal of the story, especially with adults. Everywhere we went, came the opportunity to spend more money. The best thing about the day was that we spent a lot of time together. There were some bright moments. There was an exciting Waterworld action theatre performance, complete with explosions, drama and getting the crowd wet. The roller coaster in the Jurassic Park was also priceless. 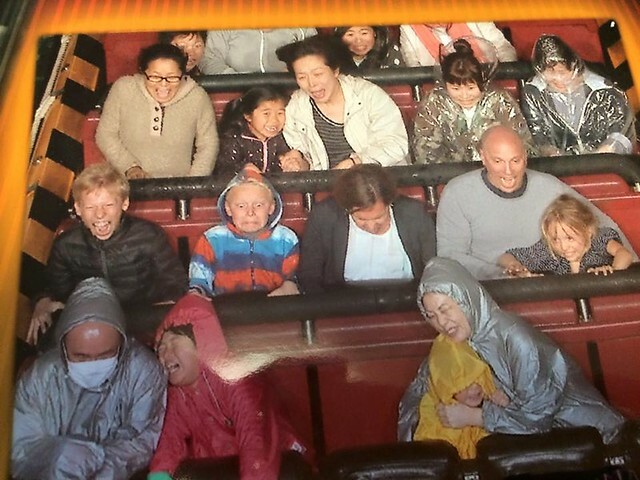 It was the first time on a roller coaster for the kids. I am glad I went and got it over with. 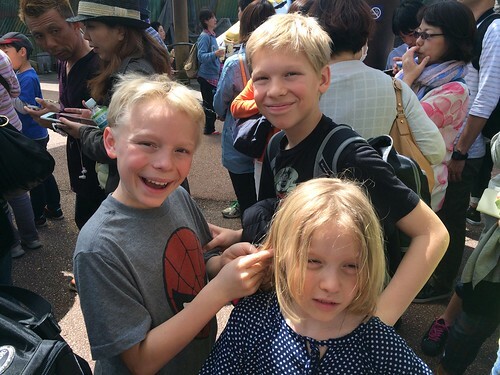 How can a family with three young children who lives in Osaka, not go to USJ? However, it would have been better on a less crowded day. I’ll look into the Google+ as I use gmail and drive daily.